Head away from Five Rivers along the boardwalks and bridlepaths to Avon Farm Cottages. Over the A303 take the byways to Larkhill and turn left onto the road. Turn right after a short spin along the road to get onto Salisbury Plain and pick up the Southern Transit. Turn right up the hill at the Silkhill Plantation leaving the Southern Transit and picking up the byway to Bulford Camp. Take the single track through the trees at Bulford Camp to come out alongside Tidworth Road. Turn right away from Tidworth Road to Hills Copse where you pick up another bridle path taking you back under the A303 by Cholderton Rare Breeds Farm. From here take the trails towards Bocsombe Down riding round the edge of the site up to the side of the A345. 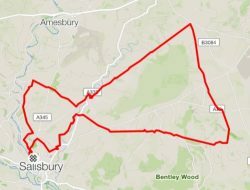 From the back of Boscombe Down, take the farm track down to the A338 and cross over to climb up the hill to Gomeldon. At Gomeldon take the paths through the fields to take you to the foot of Figsbury Rings. From here, cross the road to take the bridlepaths along the river to Ford. Turn right down the road at Ford then turn left on to Green Lane up to Bishopdown Farm. At the top of Green Lane turn right along the road by the new builds at Bishopdown Farm. From here you can pick up the trails along the fields over to the Harvester by Old Sarum. Cross the road to Hudsons Field and cruise back to five rivers. 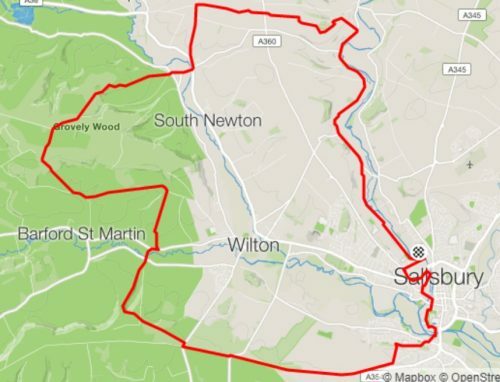 18 mile route over easy terrain, perfect for beginners. Take the boardwalks, gravel paths and farm tracks form Five Rivers coming out on the road at Avon Farm Cottages. From here take the roads to the foot of Snakey Hill, turning right through Little Durnford Farm and following the paths up to monarchs way. Ride up the rooty climb on Monarchs way and pick up the farm tracks to the road turning right to the traffic lights at high post. Cross the road and turn left, taking the bridlepath along to boscombe down. Ride along the fence line and follow the double track down from here to the A338. Cross over the A338, past the ford and up to Gomldon Primary School. 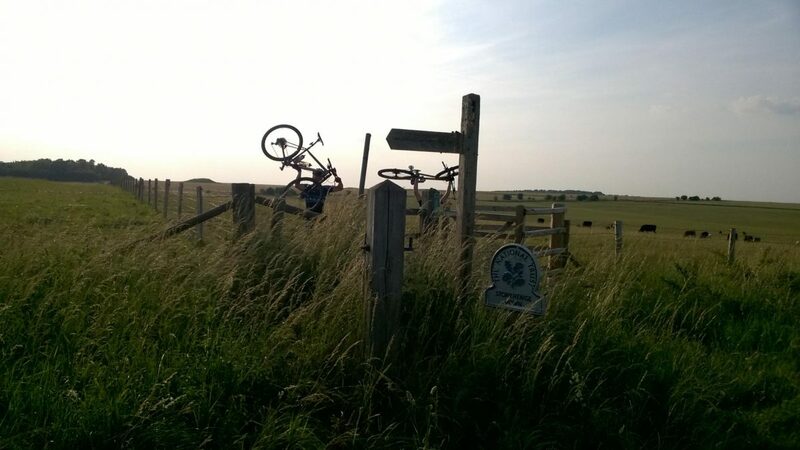 Drop into the fields at the top of the hill following the trails untill you reach the foot of Figsbury Rings. From here take the paths by the river to Ford, ride along the road and turn left taking Green Lane up to Bishopsown Farm. 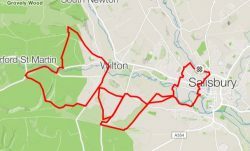 Ride along the roads through the estate to St Marks hill where you can take a gravel path along the top of the hill to the Harvester. Stop here for a pint or head down Hudsons Field and back to Five Rivers. 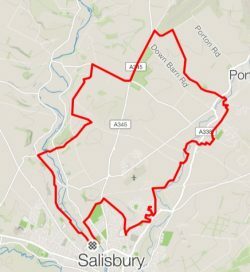 Roughly a 17 mile loop starting from five rivers and heading out via Old Sarum, past Keepers Cottage over the rolling hills to meet Monarchs Way. 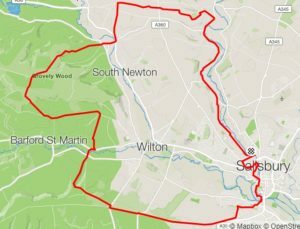 From there a couple of tight, rooty downhills take you into the Woodford Valley at Netton where you pick up more single track leading towards Wilsford. Some wider double track takes you out from here past a viewpoint for Stonehenge and over to Druids Lodge. From Druids Lodge, a short pedal by the side of the main road takes you to a track leading back into the Woodford Valley. 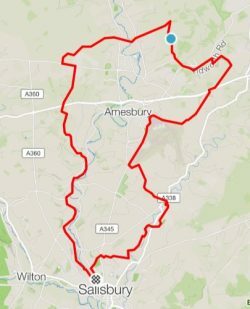 From here there is a mile or so on road taking you past the Wheatsheaf and over to Avon Farm cottages where you can pick up more single track taking you back to five rivers.